Active vs. Passive Investing: Which Is Right For You? You are busy, I get it. You have errands to run, kids to feed, work that needs to get done, loved ones to tend to and more. When beginning your real estate investing journey, it’s imperative to compare and contrast active investing vs a passive role investing your funds. Let’s take a high level look at the differences between being an active vs. passive investor and which method would work best for you and your desired lifestyle. An active investor is more likely to source a deal, analyze it and make an offer. Post close an active investor is prone to leading the rehab of the unit(s) to get it rent ready and in some cases, landlording. This “hands on” approach can make for a higher return of your investment dollars than that of a passive investor. Active investing doesn’t necessarily mean that you are the sole person implementing and carrying out the tasks of the investment. You can build an investment team of like-minded individuals (property managers, lawyers, brokers, etc.) that can assist if not facilitate the entire process and you would in turn manage the facilitators – similar to a coach. Activate investing does allow you to be the in the driver seat in efforts to cut expenses and add value in the ways that you deem fit. Passive investing can entail forking over your funds to a sponsor or syndicator to handle all aspects of the investment. You will have little to no involvement in the everyday decision making. You will also hold little to no power to recoup your investment without other parties being in agreeance or prior to the investment plans’ timeline. This is great for a multitude of people including the busy professional and the high networth individual. With this method, you’ll be privy to investments that would be too large for you to take down with your own sole resources. Another method for passive investing is “turnkey” investment opportunities. Turnkey operators provide a done for you service that finds a property, rehabs it, places tenants in the property and hiring a property manager to oversee the property all before you purchase the already cash flowing investment This process allows you to collect the cash flow without having to work, or worry about tenants. It’s a great option for people who want a decent return without doing the heavy lifting. Understand that since additional parties are involved, the returns on your investment are slightly handicapped while the return of your time and energy is greatly exemplified. 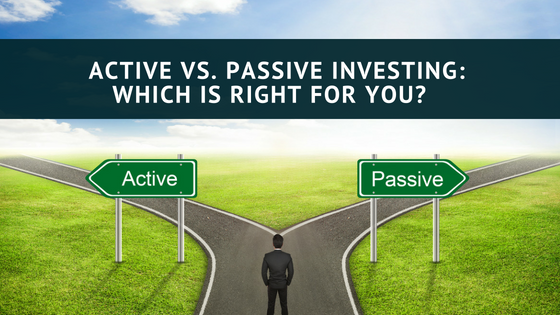 Can you be both an active and passive investor? Yes you can. A great strategic mix of both passive and active investments can pay you dividends for many years to come. It can also put less demand on you in terms of personal time and energy spent managing those assets. Knowing what your time is worth and your real estate investing objectives are will help you set a path for the right mix of active and passive real estate investments for your desired lifestyle. Every week, we send an email sharing our best advice, tips and strategies related to Real Estate Investing. Each of these weekly emails contain relevant and actionable information that can help you no matter where you are in your investing journey. Daray is also the host of the New and Noteworthy entrepreneurial podcast Before the Millions interviewing high profile entrepreneurs and millionaires about the way their lifestyle is design as a byproduct of Real Estate Investing.